George W. Atkinson and Alvaro F. Gibbons. Prominent men of West Virginia. Wheeling WV, W.L. Callin, 1890. Matthew B. Gilmore and Michael R. Harrison. “A Catalog of Suburban Subdivisions of the District of Columbia, 1854-1902.” Washington History, Vol. 14, No. 2, Commemorating the Centennial of the McMillan Plan, Part II (Fall/Winter, 2002/2003), pp. 26-55. Harvard College. Class of 1864. Secretary’s Report: no. 5, June, 1874-June, 1881. Boston, Harvard College, 1881. Ed Hatcher. 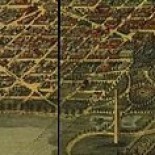 “Washington’s Nineteenth-Century Citizens’ Associations and the Senate Park Commission Plan.” Washington History, Vol. 14, No. 2, Commemorating the Centennial of the McMillan Plan, Part II (Fall/Winter, 2002/2003), pp. 70-95. Edwin Melville Williams. “The Press, 1789-1928” in Washington Past and Present, a History. John Clagett Proctor, ed. New York, Lewis Historical Publishing, 1930.